WordPress 4.9 “Tipton” was released on November 15, 2017, and we’ve gathered a complete guide to all the new features & changes. Here you’ll find everything you need to know about WordPress 4.9’s new features, including detailed write-ups about all the changes, and tutorials on how to use the new features. Subscribe to our YouTube channel for more videos like this one. Let’s start with the changes that will impact everyday WordPress users, bloggers and content producers. 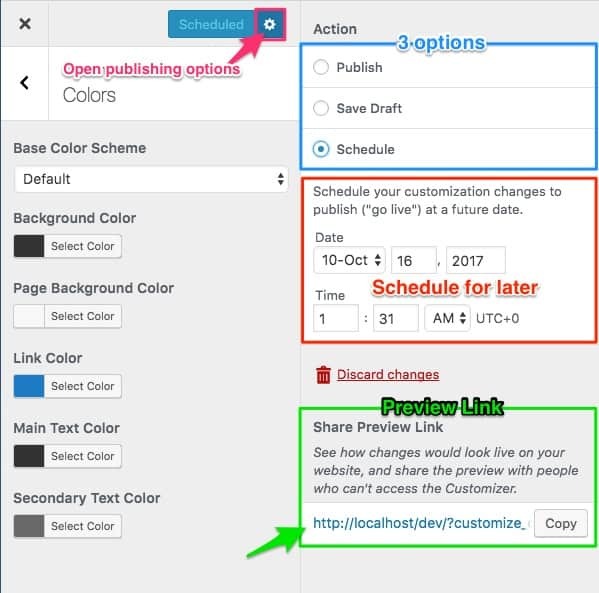 This release brings about several improvements to the WordPress Customizer. You access the Customizer via the Appearance > Customize menu. It provides a simple way for you to make design changes to your site without editing any code. In prior versions of WordPress, you either had to publish your changes right away, or discard them. 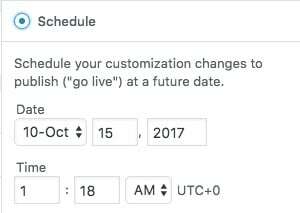 As of WordPress 4.9, you can now schedule changes to go live in the future. Choose a date & time in the future, click Schedule, and you’re all set. 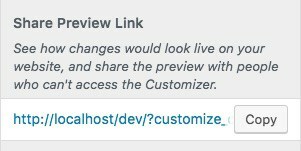 Not only can you schedule changes, but you can now provide a link for someone else to preview your changes. 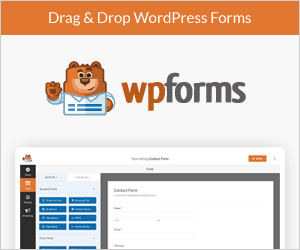 You don’t have to create a WordPress account for them. They don’t have to login anywhere. You simply share a link and they can preview all the changes you’ve made, before they go live on your site. Your preview link will have a unique ID following the URL parameter customize_changeset_uuid. An example is below. The process for creating new menus & adding menu items has been improved. Instead of trying to explain it in words, check out the animation below. You can still access Menus via the Customizer, as well as Appearance > Menus. But the Customizer will give you the most flexibility. In previous versions, clicking the Change button to switch themes in the Customizer just displayed your currently installed themes in the left sidebar. …and you can browse and search them on the right side of the Customizer. WordPress 4.8 brought about several new widgets to use in your sidebars. WordPress 4.9 adds one new widget, and improves several existing ones. You can now add photo galleries to your sidebar in the same way you’ve been able to add them to posts. Learn all about the new WordPress photo gallery widget. A simple, but welcomed, improvement to the Text widget is the ability to add media. You can now easily insert images, right alongside some text, to create more complex & engaging widgets in your sidebars. Now they are enabled by default, and you no longer need this code. Following in the footsteps of shortcode support, Text widgets also now support embedded content. Embed tweets, Facebook posts, ecards and so much more. Previously, the video widget supported YouTube & Vimeo as the only third-party video providers. Now, you can use any third-party video service that is supported via oEmbed. Read the official WordPress post on widget changes. CodeMirror will now be used in the Customizer when making edits to your theme’s Additional CSS. If you are using a Custom HTML Widget in one of your sidebars, CodeMirror will improve your editing experience there, as well. 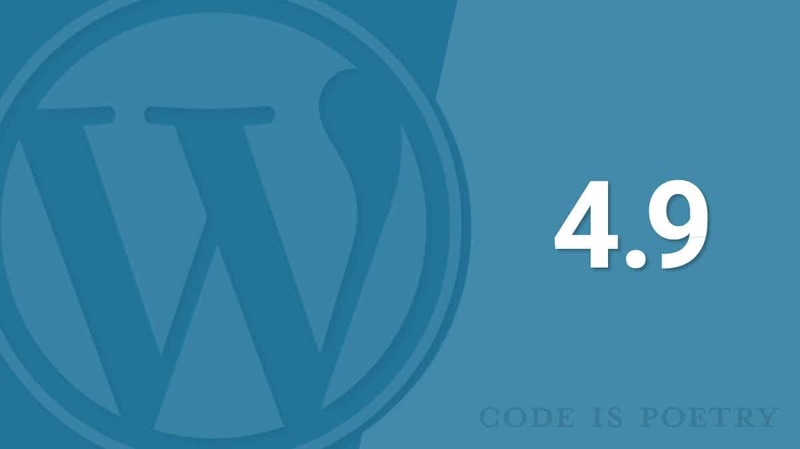 With the addition of CodeMirror, WordPress 4.9 is also helping to prevent fatal errors from occurring on your site. 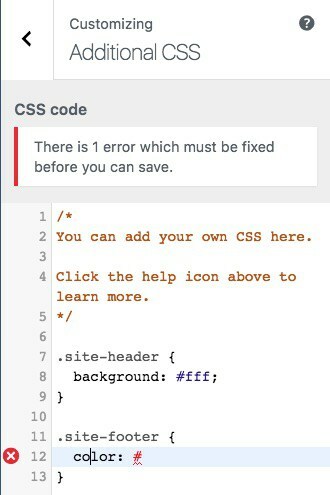 If you use the theme or plugin editors in the WordPress admin area, and you make a coding mistake that would normally produce a fatal error, WordPress will not let you save your changes. This will help prevent your site from crashing, showing a blank white screen, and other negative effects caused by simple coding mistakes. NOTE: We DO NOT RECOMMEND you use the theme/plugin editors under any circumstance. Here are a few less significant updates that aren’t making headlines, but could have an impact on your site. WordPress will make it’s best guess as to where your existing navigation menus & widgets should be placed in your new theme. This should make switching themes a much better experience for many users. When a user tries to update their email address, or anyone attempts to change the site admin email address, the following will now occur. This will help tighten up account security, and prevent hackers from gaining control of your WordPress site. The old Press This tool, now removed in WordPress 4.9. In WordPress 4.9, Press This has been completely removed from the WordPress core code. However, if you need it back, the functionality has been ported over to the Press This plugin. Read all about the changes to Press This on wordpress.org. REMOVED: After feedback from the WordPress community, this feature was removed. It will likely be added back in the near future. WordPress has decided to encourage people to try the new Gutenberg editor by activating the plugin. Gutenberg has not officially been released yet, but this provides a way to get more user feedback. You’ll notice a new widget at the top of your WordPress Dashboard. There were also some improvements to Roles & Capabilities in 4.9. 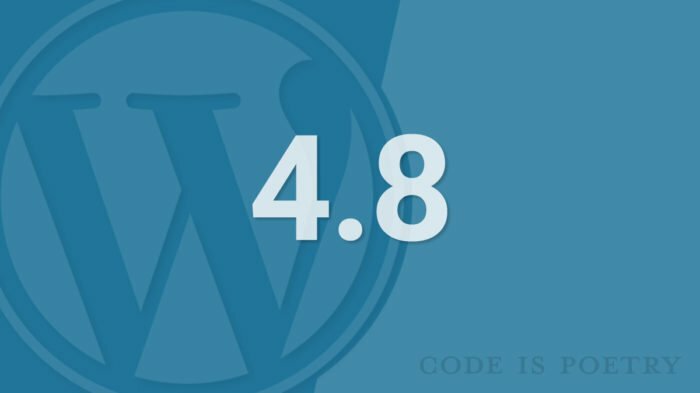 Now we’ll take a look at the new features in WordPress 4.9 for developers. These are updates to the WordPress core code that won’t affect most users, but give developers more flexibility when working on custom WordPress themes & plugins. CodeMirror not only improves the Additional CSS and HTML Widgets, but it has also been added to the theme & plugin editors. Most developers should be making updates via SFTP, Git, etc., but in the rare case you might need to use the theme or plugin editor in the admin, it’s much easier to use. There were also a few updates to WordPress Multisite. Learn more about the Multisite updates on the WordPress blog. For anything else I might have missed, WordPress has put together a 4.9 Field Guide, to go along with their official post. What do you think of the WordPress 4.9 release? I’d love to hear your thoughts in the comments.